There are many ways to get involved with Operation Christmas Child, a project of Samaritan's Purse that brings the Good News of Jesus Christ to children around the world. When Carol and Pat Nelson volunteer with Operation Christmas Child, they know first-hand how much each gift can mean. Twelve years ago, the Nelsons packed their first shoebox for Operation Christmas Child and sent it off with a letter and a picture. Seven months later, they received a thank-you letter written in French from a 9-year-old girl named Elizabeth in Burkina Faso. They continued to communicate by mail, and last year the Nelsons had the opportunity to travel to Africa and meet Elizabeth where she lives. We have processing centers in eight locations across the country. The Nelsons traveled over 500 miles from Easton, Pennsylvania, to help inspect and sort shoebox gifts and prepare them for international shipping. 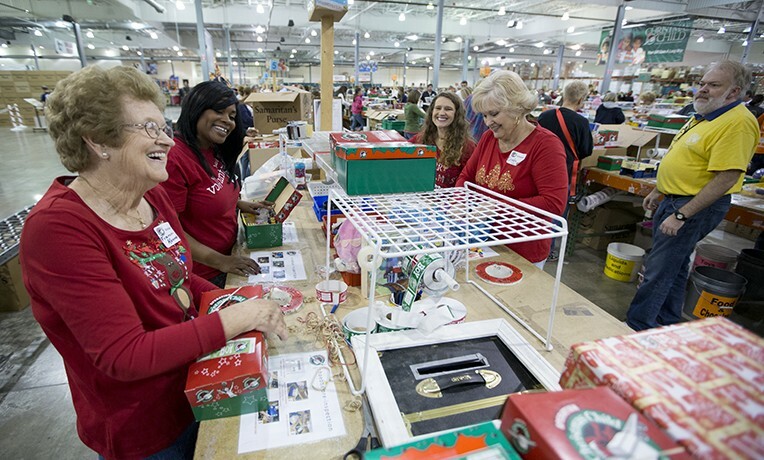 They are among more than 110,000 U.S. volunteers who serve faithfully at Operation Christmas Child’s eight processing centers and over 4,000 local collection sites. More than 8,700 volunteers like the Horches serve year-round with Operation Christmas Child, focusing on prayer mobilization, church relations, community relations, media relations, or collections. In addition to our headquarters in Boone, we have processing centers in Atlanta, Baltimore, Charlotte, Dallas-Fort Worth, Denver, Minneapolis, and Southern California. Please pray for Operation Christmas Child and our upcoming National Shoebox Collection Week, November 16-23. You can find out more here about packing a shoebox, registering to volunteer, and ordering free materials.